Okay, I’m going a bit Sandra Lee on this one. These are such wonderful gems. Korean grocery stores carry shrink-wrapped pre-cooked octopi. They’re tender, slightly salty and ready to eat straight out of the pack! That may be why they are a bit on the pricey side. This little guy cost 10,000 won. Today, we played a bit with this octopus and made two different styles–Spanish and Korean. The Spanish version is based on a recipe by Spanish Reicpes Pic by Pic. 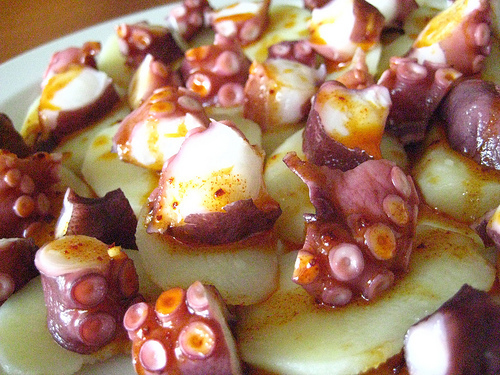 Spanish octopus is usually cooked Galician style. It’s a simple matter of octopus slices on top of boiled sliced potatoes, drizzled in flavored olive oil. I peeled and sliced some potatoes and boiled them with sea salt, some bay leaves and whole black peppercorns until they were tender. I was very careful with them because I didn’t want them to break. After draining, I ran them under chilly water to bring the heat down. While the potatoes were cooking, I mixed a quarter cup of extra virgin olive oil with two minced garlic cloves and half a teaspoon each of Spanish smoked paprika and Korean gochugaru (red pepper powder). I used the smoked paprika just because I had it on hand. In hindsight, it didn’t work well with it. It is just fine with the gochugaru, which makes a fine substitute for hot sweet paprika. I also gently sliced the octopus. If you have a nice sharp knife it cuts through like butter. Remember, let the knife do the work. Don’t saw. Slice. I made V cuts to remove each arm. Even though the guts are all cleaned out, the beak is still in there. Remove it. Then just slice everything like how you see it at a sushi bar. I laid the cooled potato slices on a plate. Topped each slice with a slice of octopus. Threw a few extra slices in between the gaps. Drizzled it all with the olive oil mixture. That’s it! Octopus and olive oil must have been siblings in a past life. The potatoes, for me, were the odd ingredient. They created both a finger food platform and a balancer for the olive oil and garlic. Eun Jeong was not a fan at first until she tried them with the potatoes. The Korean version is even simpler. It was just a matter of taking the octopus out of the package, slicing it, and serving it with vinegared red pepper sauce (Cho Jang 초장) and sqeezing some lemon over it. I know, lemon is not really a Korean method, but Eun Jeong has really taken a liking to it, comparing the flavor to ceviche. It is bright and oceany and truly brings out the wonderful flavor of octopus, which tastes like shrimp and a hint of oyster. The cho jang gives it extra brightness and life. It feels like summer. Enjoy with a nice wine. Fantastic recipes! Love the paprika oil idea. But did you really pay £6762.00 – six thousand pounds! I’m hoping it’s a typo. Thanks for pointing that out. My Local Currency plug-in was set to USD and not KRW. I think it’s fixed now. What interesting recipes. I wish I could try them as we can get those pre-cooked octopus here too. Sadly, every time I’ve had octopus, it always disagreed with my digestive system. I like it when you cook . Cook more. Stuff like this is gold! Can I run this in Daegu Pockets? If so, do you have hi-res pics? nice to see you got the paprika safe. i have my version of this dish on the menu at the restaurant and we are currently going through over 100lb’s a week. yeah it is popular. i use fingerlings and use a 20 year sherry vinegar which ads a great touch. I need to get you some sodium alginate and calcium chloride so you can have some more fun! !